One of the oldest herding breeds, the Rottweiler was a working dog long before it became known as a “vicious” guard dog. Rottweiler owners know better: they’re a great breed! We’ve researched and reviewed best-selling dog foods for rottweilers to help you find the best option for your canine companion. First off, our list of informational specs below will help you choose wisely! Food Type - Dry, wet or raw? Each food type has its own benefits and drawbacks regarding value, ingredient quality, and other factors. Dog Age - From puppy to adult to senior, different dog foods are designed for the needs of different periods of a dog’s life. 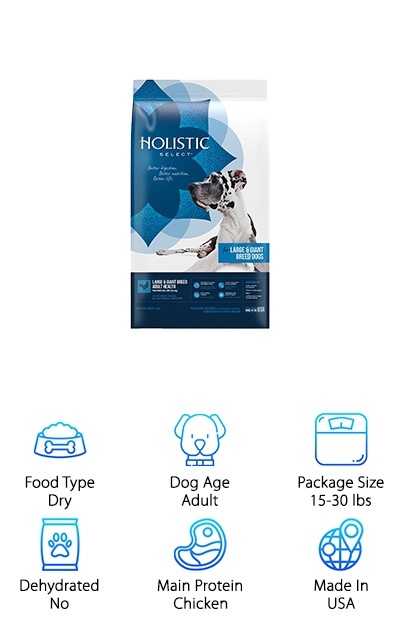 Package Size - Package sizing allows you to compare value across brands and choose the right amount for your dog’s needs! Dehydrated - Dehydrated dog food has emerged on the raw dog food market as a great option for raw food with a long shelf life. Main Protein - Whether you want to give your dog a taste of something different or avoid certain proteins, this info is important! Made In - We focused on dog foods made in the USA, since the factories are more likely to be strictly regulated and quality tested. Settle in with your dog and make sure to get their opinion as you read through our reviews! The top pick and budget pick summarize our overall favorite options among dog foods for rottweilers, but they’re far from the only possible choices for your dog. From puppy to adult, our reviews cover it all! Do you want a dog food that’s customized for your rottweiler’s needs? 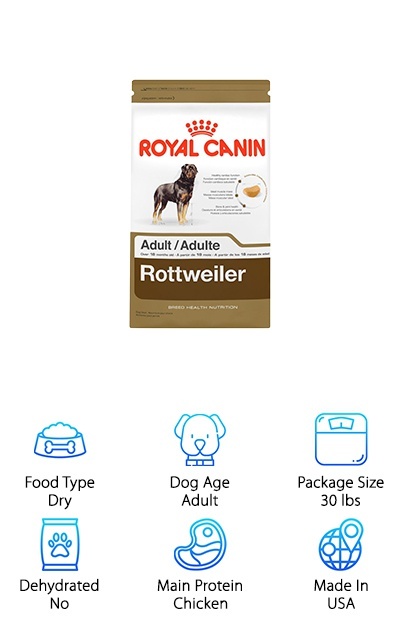 Royal Canin Breed Health Rottweiler Adult formula might be your dog’s new favorite kibble! This dry dog food starts off with a specialized shape and hard texture designed for the strong teeth and jaws of the rottweiler breed, and encouraging them to chew, not swallow kibble whole! Although generally a healthy breed, rottweilers can be prone to heart problems, so this Royal Canin dog food provides supplements like taurine, EPA, and DHA for cardiac health. EPA and DHA are also good for brain and nervous system development. Other supplements support bone and joint health, which is especially important for large breeds. High-quality protein content helps your dog maintain an active lifestyle and keep their muscles lean and strong. If you want to treat your rottweiler like royalty, you can’t go wrong with Royal Canin! Our pick for the best food for rottweiler breeds with a low price is the Iams Proactive Health dry kibble for large breed dogs. Beet pulp and prebiotic FOS provide the necessary fiber to make digestion easy but thorough, while chicken fat and fish oils provide omega fatty acids for healthy skin and a healthy coat. Chicken and eggs are the main protein sources to keep your dog’s muscles strong and lean. Chicken by-product meal acts as a source for glucosamine and chondroitin, which are important supplements for joint health. Antioxidants, vitamins, minerals, and other essential nutrients support your dog’s health from their heart to their immune system and everything else. It’s all made in the USA, too. 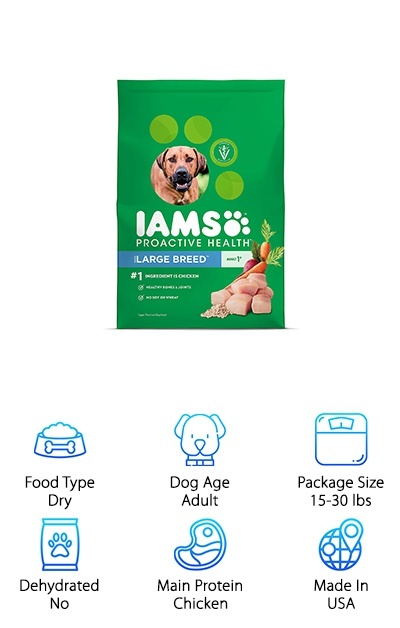 Plus, this Iams dog food comes at a great price that’s easy on the wallet. Considering how much large breeds can eat, that’s an important feature! 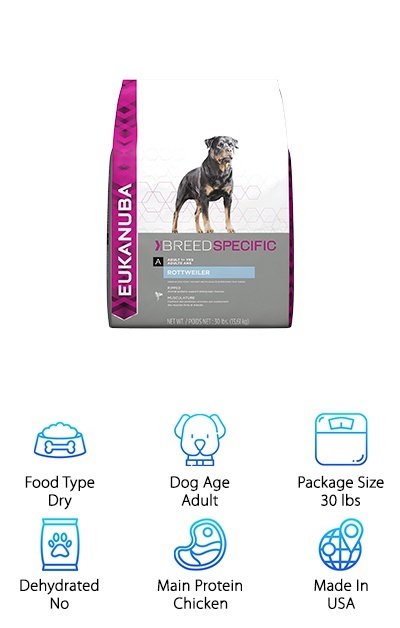 Some dog owners want a dog food formulated just for their dog’s specific needs, and Eukanuba provides that with their Breed-Specific Rottweiler Dog Food. The 3D DentaDefense kibble size and shape design helps to reduce tartar build-up for better dental health, plus calcium supports strong bones and teeth. Vitamin E and beta-carotene helps to support the immune system. Plus, an L-carnitine supplement helps your dog burn fat and keep their metabolism at peak performance, which is ideal for active dogs like the rottweiler breed. B-vitamins are also supplemented, and fiber from dried beet pulp keeps their digestive system moving along. Other supplements encourage a healthy coat and skin, too! This dry dog food provides full-body health to help keep your rottweiler happy and healthy! It also offers a great value on top of being packed with good ingredients. They offer a large breed puppy food that we loved, too--keep reading if you want a rottweiler puppy food! Available in recipes for large breed puppies, adults, and seniors, the Hill’s Science Diet Large Breed line is a favorite pick for the best dog food for rottweilers. The Hill’s Science Diet brand is recommended by veterinarians and is made in the USA with high-quality ingredients. This line includes a lamb meal recipe. Lamb meal is a great choice for puppy food and dog food since it is so easy to digest. Each recipe provides glucosamine and chondroitin for healthy joint support, plus fiber for smooth digestion and vitamins, antioxidants, and minerals for total body health at any life stage. The Hill’s antioxidant blend has been clinically shown to help support a healthy immune system. With no artificial colors, flavors, or preservatives and no chicken by-product meal, you know your dog is getting high-quality nutrition. Support your dog from puppyhood to adulthood with this dry dog food made just for large breeds! Looking for the perfect wet dog food for your adult rottweiler? 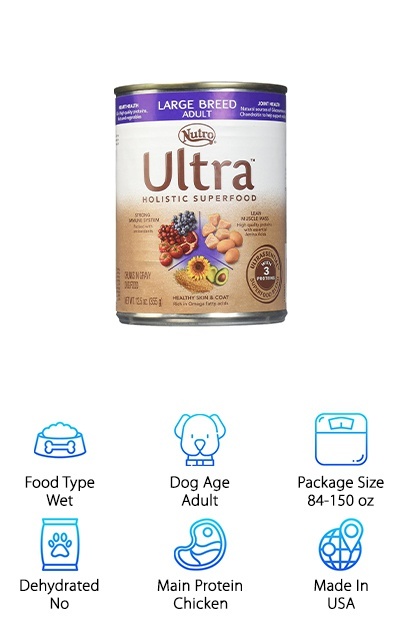 One of our favorite options is the Nutro Ultra Large Breed wet dog food, available in packs of 12 12.5-ounce cans or 24 3.5-ounce cans. Use it as a supplement to dry kibble or feed alone--dogs weighing 50 pounds require about 55 ounces (2.6 cans) per day. Protein from chicken, lamb, and salmon provide a variety of high-quality sources that are easy on the stomach. Chondroitin and glucosamine supplements help to support joint health, an important consideration with large breeds. Plus, omega-6 and omega-3 fatty acids help keep their coat soft and their skin hydrated. Wet food is a great way to spice up your dog’s regular meals or help them lose weight without depriving them of a full stomach. With superfoods, antioxidants, fatty acids, and high-quality protein sources, your rottweiler is practically guaranteed to love this dog food! The Purina Pro Plan FOCUS dry dog food for large breed puppies is ideal for the needs of a growing rottweiler puppy. With high-quality protein from chicken and dried egg product, plus glucosamine from fish meal and poultry by-product meal for joint support, your puppy will have everything they need to grow big and strong! Phosphorous, calcium, and other minerals help keep your pup’s teeth and bones strong, while DHA from fish oil encourages brain and vision development. Antioxidants and vitamins for the immune system and more help to support your rottweiler puppy from nose to tail! 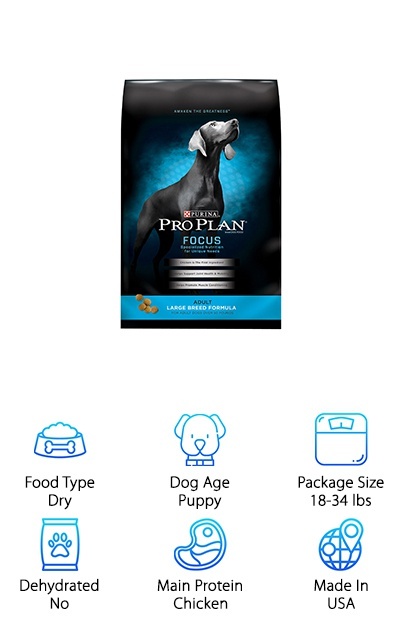 If you’re looking for the best dog food for a rottweiler puppy that won’t break the bank, Purina Pro Plan FOCUS for large breed puppies offers a high-value solution to your puppy’s nutritional needs. This highly nutritious puppy food can also be used for pregnant or lactating females. One great choice for the best puppy food for rottweiler dogs is Eukanuba’s Large Breed Puppy Food for dogs less than 24 months old. Rottweilers, like other larger dog breeds, have a different growth period than medium and small breeds, so they need different nutrition to meet those needs. The Eukanuba puppy food for large breeds supports joint health with chondroitin and glucosamine sourced from chicken by-product meal, plus delicious chicken and dried egg product provide protein for building strong muscles. Fiber from beet pulp and prebiotic FOS help ensure your dog is thoroughly digesting their kibble. DHA from fish oil encourages brain and nervous system development, while omega-6 and omega-3 fatty acids keep your pup’s coat shiny and soft. Choose from 5-pound, 16-pound, or 33-pound bags depending on your needs. 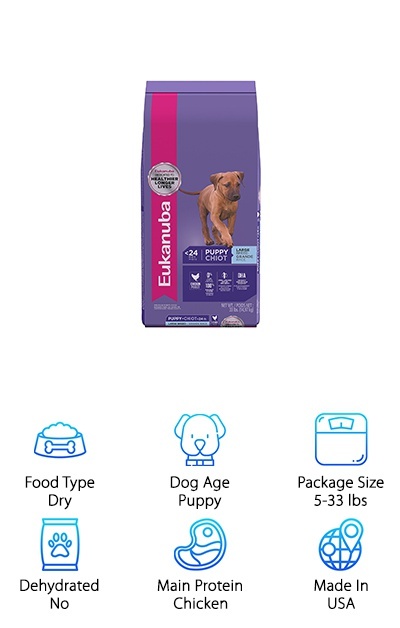 Eukanuba also makes a breed-specific adult dry dog food for rottweilers, which we reviewed above! Sometimes a dog will develop an allergy to common dog food ingredients like chicken. 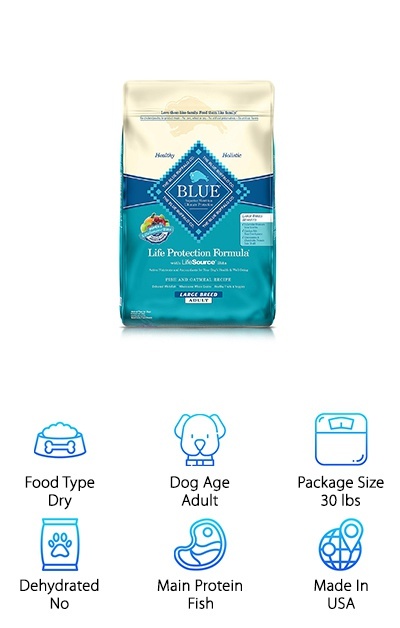 If you need to avoid chicken and poultry-related ingredients, Blue Buffalo offers a corn-free, wheat-free dog food for large breeds with chicken fat as the only poultry ingredient, and it’s a small portion of the overall ingredients. With deboned whitefish and Menhaden fish meal combined with barley and oatmeal, your rottweiler can get a protein-rich diet without dealing with corn, wheat, soy, or poultry and animal by-products. Potatoes, carrots, sweet potatoes, blackberries, pumpkin, spinach, and more provide natural sources of important vitamins and minerals. Probiotics and fiber encourage good digestive health, too, while glucosamine and chondroitin help to support the joints. Since rottweilers can grow to large sizes and go through a fast growth period, joint support is crucial to healthy development. The various supplements in this dry dog food help to keep your pup’s coat shiny, their teeth strong, and their immune system at top performance. If you’re looking for a holistic rottweiler food that focuses on whole foods and all-natural ingredients, this dry dog food designed for large breeds of 50+ pounds has it all. Protein is sourced from chicken meal and pork meal, with fatty acids and healthy oils from anchovy and sardine meal. Rather than wheat products, this large breed kibble uses oatmeal and rice as sources of carbohydrates and fiber. Your rottweiler will have plenty of digestive support thanks to the prebiotics, probiotics natural fiber from sources like dried beet pulp, and digestive enzymes. A strong digestive system is a big part of ensuring your dog is getting the nutrients they need! Supplements like glucosamine support healthy joints, and biotin supports strong nails. Other vitamins and nutrients come from whole-food sources like tomatoes, quinoa, apples, blueberries, cranberries, and more! If you like ingredients like this, the Holistic brand also offers a puppy food for large and giant breeds, too! Are you looking for the best food for a rottweiler puppy? 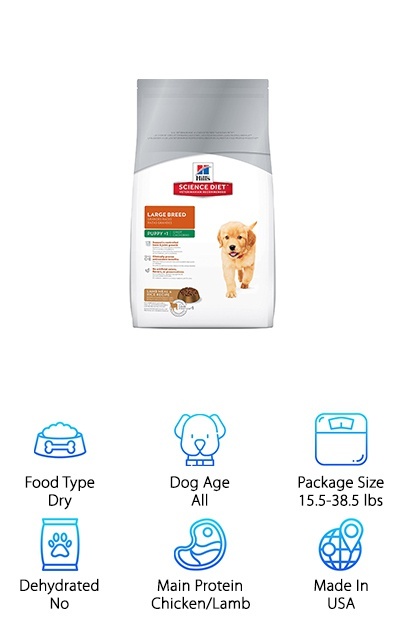 Royal Canin has a great puppy food designed just for large breeds from 5-15 months of age. Royal Canin MAXI puppy food is optimized for the long growth periods of large breeds like the rottweiler, which need a balanced energy intake along with plenty of vitamins and minerals. Supplements of vitamin E, vitamin C, taurine, and lutein provide immune system support, while EPA and DHA support the development of the brain and nervous system. Large breeds also need plenty of bone and joint support, so the MAXI puppy food includes glucosamine, chondroitin, calcium, phosphorous, and omega-3 fatty acids to help build strong bones and joints. Plus, prebiotics and probiotics help keep your rottweiler puppy’s digestive system happy and flowing smoothly. If that’s not enough, Royal Canin also offers breed-specific rottweiler puppy food, too!